Evergreens are an all-purpose term used to describe conifers that are trees with needles instead of leaves. These types of trees are resistant to both cold weather and water loss. 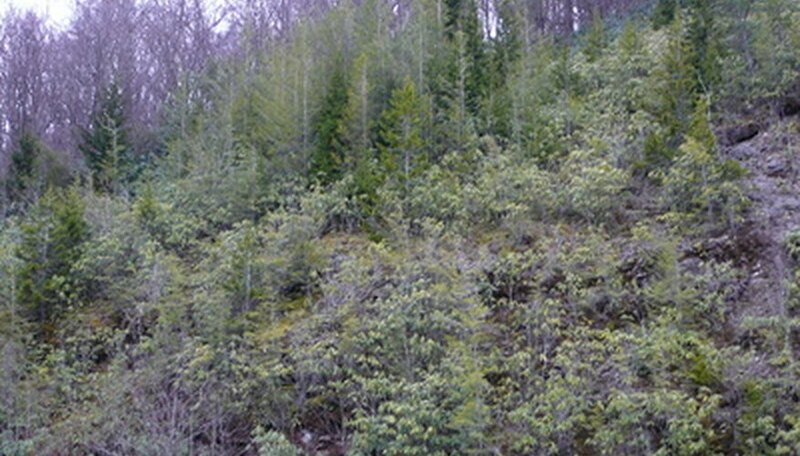 In Tennessee, a number of different types of evergreen conifers exist, including the Northern white cedar, the Eastern red cedar and the Fraser fir. The Northern white cedar, also known as arborvitae, is a slow-growing, medium-sized tree that grows to an average height of 66 feet. The tree is found in swamps and limestone soils, according to “Eastern Trees” by George A. Petrides, and is valued for its timber that is resistant to decay and tolerates moisture. The bark is brown with an orange tint that sheds when the tree ages. The cones are bell-shaped and develop after six years. The Eastern red cedar is classified as a juniper and has two types of leaves, juvenile and scale-like on the same plant, according to “The Illustrated Encyclopedia of Trees of the Americas” by Tony Russell, Catherine Cutler and Martin Walters. The Eastern red cedar is the most widely distributed conifer throughout Eastern and Central North America. The tree grows to a height of 100 feet and has a narrow, cone-like shape. The bark is red-brown and sheds off the tree in narrow strips. The needles are dark green on top with a gray-green underside. Its fruit resembles berries that turn dark blue when mature. The Fraser fir is common in the Appalachian mountains of east Tennessee, where it grows at altitudes of 6,500 feet, according to “The Encyclopedia of North American Trees” by Sam Benvie. The tree reaches heights of 50 feet, and its symmetrical pyramid shape makes it a favorite Christmas tree. The bark is brown when young, turning pink-gray when older and covered by resin. The needles are dark green on top with a white underside. The round cone grows upright on the branches and is covered by a thick resin in the winter.